GH3DPC-477 | Size: 50 ml / 1.69 fl.oz. 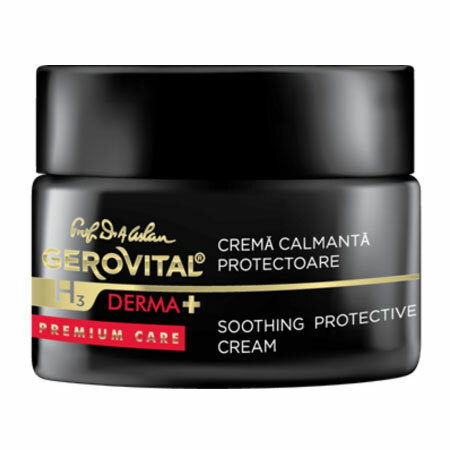 Packed with the skin-repairing and irritant-soothing, calming, nourishing, moisturizing and emollient ingredients, the cream has been designed to offer protection and regeneration to sensitive, prematurely aged or mature complexions. Comforts the skin after the application of the Whitening Gel, Exfoliant Booster with AHA, or other aesthetic procedures. Clinical tests* performed on sensitive, irritated and mature complexions show an average decrease of the trans-epidermal drawdown of 67.48% after 8 days of usage. *EVIC instrumental evaluation. (EVIC is the largest Romanian private center for research, experimentation and evaluation of cosmetic products, biocide and medical devices). Combines actives that heal sensitized, congested or irritated complexions affected by skin exfoliation or whitening treatments. CENTEROX™, a purified extract from Centella asiatica containins madecassoside and asiaticoside, two bioactive compounds which help repair and revitalize skin’s surface, stimulate the synthesis of new collagen fibers, improves microcirculation, softens the fine lines and wrinkles. Usage: Apply morning and evening, or after exfoliation or whitening treatments or aesthetic interventions. Spread in generous amount on the cleansed and make-up free face, neck and décolletage. INGREDIENTS: AQUA, GLYCERIN, SQUALANE, UNDECANE, PLUKENETIA VOLUBILIS SEED OIL, CETHYL ALCOHOL, GLYCERYL STEARATE, DIMETHICONE, BUTYLENE GLYCOL, TRIDECANE, THEOBROMA CACAO SEED BUTTER, DIPALMITOYL HYDROXYPROLINE, PHENOXYETHANOL, PEG-75 STEARATE, HYDROXYETHYL ACRYLATE/SODIUM ACRYLOYLDIMETHYL TAURATE COPOLYMER, TOCOPHERYL ACETATE, CERA ALBA (BEESWAX), ISOHEXADECANE, DIMETHICONE CROSSPOLYMER, CETETH 20, STEARETH-20, MADECASSOSIDE, ZANTHOXYLUM BUNGEANUM FRUIT EXTRACT, PARFUM, TETRASODIUM EDTA, POLYSORBATE 60, ASIATICOSIDE, TOCOPHEROL, DECYLENE GLYCOL, CAPRYLYL GLYCOL, DEXTRAN, PALMITOYL TRIPEPTIDE-8, HYDROGENATED PALM GLYCERIDES CITRATE, GLYCINE SOJA OIL, BENZYLSULPHONYL D-SERYL HOMOPHENYLALANINE, AMIDINOBENZAMIDE ACETATE, SODIUM HYDROXIDE, CITRIC ACID.